Think for a moment about all the distractions that compete for attention in your work life. Phone calls, texts, emails, meetings. Questions from employees. Questions from clients. Unanticipated interruptions. Add to this your personal life, which has the same ongoing level of activity. Now, put yourself in the mindset of your target audience and your clients. They suffer from the same busy professional and personal challenges you experience. The point? Offices – and the people who manage and work in them – are enormously busy. In short, offices are centers of multi-tasking that offer little or no time to pause and contemplate the next steps. Cal Newport, a computer scientist at Georgetown University, is the author of Deep Work: Rules for Focused Success in a Distracted World. Newport points out that constant distractions that challenge our work life tend to dominate our work life. They take away from what Newport calls Deep Work, which is the ability to focus without distraction on a demanding task. According to Newport, Shallow Work (the opposite of Deep Work) fragments and pre-empts one’s ability to come up with one of those benchmark “A-ha” solutions that can make your unique selling proposition stand apart. Apply Deep Work to communications and you get a sense of how important it is to think differently and clearly, without distraction, and how it can transform how you go about your business and what you say about it. You can get learn more about Deep Work in a fascinating report that recently was broadcast on National Public Radio. 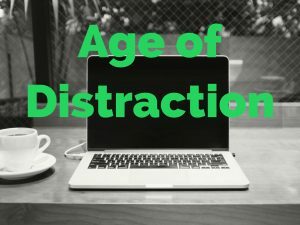 So, how does Wellons Communications help you succeed in the Age of Distraction? We adhere to the notion of keeping it simple. We develop strategies, approaches, and messages aimed at battling through the communications clutter. When possible, we use simple, declarative sentences. And we project the same message over and over again, using consistency to ensure that once we have captured attention, our message is reinforced until our audience has absorbed and agreed with it. What does simplicity do for your marketing? 1. Simple messages are easy to understand. 3. Simple messages attract attention. The most visual example of great message-making in its simplest form is a billboard. They are quick to read, present a single thought, and tell you what they think you need to learn. Let us simplify your public relations and communications. If you have read this far, you’ve been distracted enough. If our message has worked, we hope you will want to learn more about how Wellons Communications can assist you in marketing your product or service. You can reach me at 407-339-0879 or by email at will@wellonscommunications.com. Believe me, I will be happy for the distraction.